Take three different colour blocks, maybe red, yellow and blue. Make a tower using one of each colour. 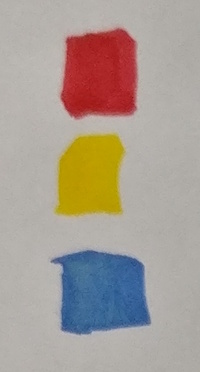 Here's one with red on top, blue in the middle and yellow on the bottom. Now make another tower with a different colour on top. How many different towers can you make? How will you know that you have found them all? You can click below to see how two learners started this task. I used multilink cubes to make the towers. First of all, I looked for towers that were red at the top. I did this again, but realised that would give the first tower. So I went back to my first tower and kept the bottom cube the same, but swapped the top and middle. Did you start the problem in the same way as either of these children? What do you think about each method? You may like to print off one of these sheets for recording three-block towers. Visualising. Investigations. Interlocking cubes. Addition & subtraction. Factors and multiples. Working systematically. Generalising. Interactivities. Practical Activity. Combinations.